Check it out in this Chickpea Moi Moi recipe. 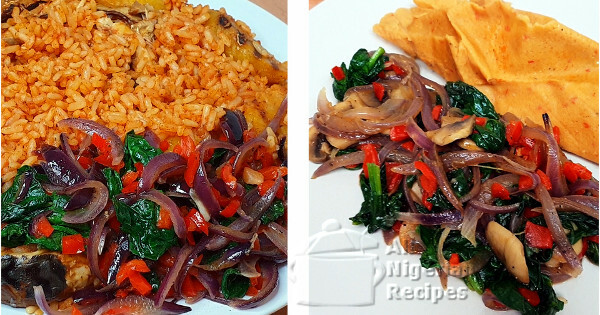 In Nigeria use tatashe in place of sweet peppers (paprika). But remember that while sweet peppers are not spicy hot, tatashe is very spicy hot. If you do not have spinach, use ugu. You can also use green amaranth if you do not mind the taste. For any green leafy vegetable you are using, the tender shoots are the best for this. For instance in the case of spinach, baby spinach is best. I highly recommend red onions for this recipe because it packs a lot of taste. If you do not have chicken oil, use virgin olive oil. Sometimes I add sliced mushrooms to this garnish especially when I will serve it with Moi Moi or Fried plantains. I am assuming that you have thoroughly washed all the ingredients that need to be washed. Slice the onions vertically. See the video below. Dice the sweet peppers (deseeded). After rinsing the vegetables, leave them like that. Do not slice them. If using mushrooms, slice them vertically. Add the chicken oil to the frying pan. When it heats up, add the onions and diced paprika. Sautee for 3 minutes. If using mushrooms, sautee it first for two minutes then add the onions and sweet pepper and sautee for 3 minutes. Add the salt and black pepper and stir very well. Add the leafy vegetables on top and leave to wilt for 1 minute. Stir very well and it is ready. Serve with any of the aforementioned meals. Yum!